This short psalm is a communal lament, pleading as a nation for God's mercy, though in what particular circumstances we cannot tell. There are, however, two excellent images pertaining to the human/God relationship, both using the metaphor of "the eyes lifted up." The two are that of servants to a master and a maid to her mistress. 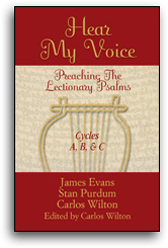 The singers of this psalm view themselves as asking for God's mercy from a similar position of subservience.